Be a dear, and don't steal my stuff. This blog and all of its contents are the intellectual property of its owner. Any replication of the material on this blog for commercial use is an infringement of copyright law. Please contact Jessica Marie if you are interested in using material from this blog for commercial use. 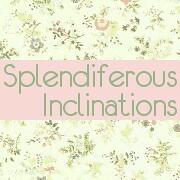 You are granted permission to use images and text (in quotes) from Splendiferous Inclinations for non-commercial use, but please notify the owner when doing so. Click here for contact information. Or, just kindly leave a comment on the affiliated post. And remember - always link back to the source.